Gratitude is the easiest path to living a happy life. During the most challenging times in my divorce process, I focused on being grateful daily. With mounting legal bills, at times acrimonious mediation sessions, financial uncertainty, and more, this was a difficult task many days. But I accomplished it each day. Some were small moments: Monkey turning back towards home on the way to school simply to give me one more hug. Other days I was grateful for family-focused activities at night. My gratitude was found in kind gestures from neighbors, knowing I was struggling with our life change. Any day I ran on the canal on a beautiful day brought feelings of appreciation. Wherever I looked, as long as I paid attention, there was something to be grateful for daily. Working hard to find the good in each day for an extended period of time has led to a happiness that is not fleeting. Difficult times come and go, but my overall perspective gets me through the challenge each time. Gratitude is the key to that success. Do you find this to be true in your own life? When I’ve been depressed in my life, one of my go to strategies is to focus on gratitude. Such a simple solution…why I don’t do it daily to ward off the blues is beyond me! I am glad to hear this helps you, too. I hope my post does help, MB. Times can be bad, but there really is something to celebrate each day. It might be small, but it’s there if you look hard enough. Great post, love it… I know I rush thru life too quickly and don’t pause to be grateful for the good stuff… thanks for the reminder! I am glad you liked this post, Brahm. I also need this reminder at times, and it is typically because I am rushing as well. Awww, I love this. It’s difficult sometimes (especially in times of extreme stress/life changing situations) to come to this place of calm. But in the end, when we do focus on the beauty of our surroundings and the good we are blessed with, we walk away with a much better outlook on life. 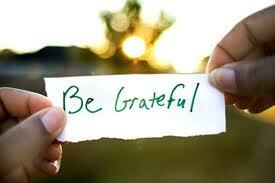 It does require a bit of effort to be grateful and practice gratitude daily, but it’s well worth it, isn’t it? I definitely agree it’s worth it. Gratitude drives happiness. Today I am grateful for hearing about the story of Joshua Bell giving a free concert at the DC Metro station… and how people walked by ignoring him. This story (I know, I find it hard to believe I only learned about it this morning) has touched me deeply. I know as a younger person I promised myself to ALWAYS stop and notice the magic around me, but I also know I don’t always do it. Sometimes for a mere excuse, other times for real reasons. I am grateful I read this story today because it reminded me of an important oath to myself. I am glad, Marie. Thanks for visiting. This is a beautiful post. I really am grateful for so much as well. And I agree, if you live your life walking in gratitude, it is easier to have more good days than bad! Glad we’ve connected through Studio30 and I look forward to reading more of your writing! Thank you, Alexa. I look forward to getting to know you personally and as a writer now that you are on the S30P team! I remember this one! I don’t think I commented before, but I should have. I like this. It’s concise and a great reminder. I am glad you enjoyed it, Joe. Thanks for re-reading it.